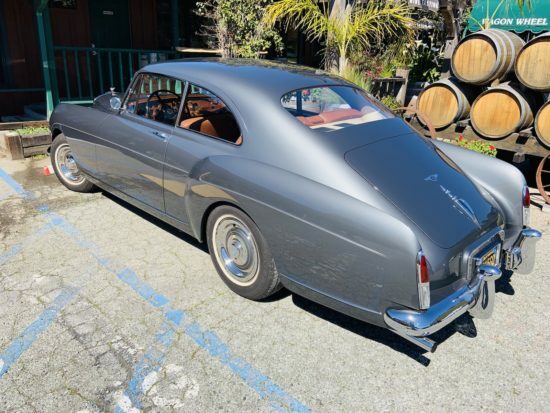 Is This A 1956 Bentley R-Type Continental by H. J. Mulliner? You are here: Home / Classic Cars / Is This A 1956 Bentley R-Type Continental by H. J. Mulliner? I saw this stunning Bentley in the parking lot of a local restaurant recently in between rain storms. What a beauty it is – I had to do some research to try and figure out the model and year. Most cars of this caliber are seen sitting on grass with a sign detailing the model information. Not this one it was out for a drive on a beautiful day with another Bentley parked nearby which was not as easy to photograph as this one. I think it is a 1956 Bentley R-Type Continental by H. J. Mulliner. Let us know in the Comments what model you think this is. Photos by Mike Gulett using an iPhone XR. This stunning Bentley was roaming the streets of Carmel Valley one day last week. The owner was in a different restaurant that the one I was in. Yes it is and very rare in LHD and probably worth a million dollars .